This blog is all about jams...great songs, songs that have that special something that after your precious 3 minutes and 14 seconds spent listening to it, you decide, you know what? I'd listen to that jam again, right now! Right now! Songs so good, you could have them on repeat over and over, and maybe over again. Just cuz they're that good. We're not looking for a certain genre, or style, we're looking for songs that will make ya tell your momma, hey momma, listen to this! 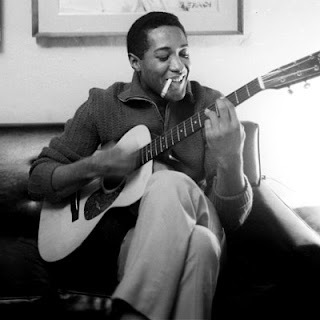 Sam Cooke made one of the best songs of the 20th century in "A Change is Gonna Come." Soulful lyrics, a powerful message, and a timely plead, make "A Change is Gonna Come" an untouchable jam and a half. The jam set the standard for many songs to come...Not only hoping for a change, but knowing that a change is coming, Sam Cooke wrote a socially conscious song that has everything that it needs to be a jam and a half. Covered by and referred to by everyone from Bob Dylan and Aretha Franklin, to our president, Mr. Obama himself, ("It's been a long time coming, but tonight, because of what we did on this day, in this election, at this defining moment, change has come to America."). Mr. Cooke wrote this timeless piece in response to two events: his 18th month old son dying in an accidental drowning, and Mr. Cooke and his band being arrested after trying to check into a "white-only" motel. Sam soon realized that his pop career up to then wouldn't be enough. Something more was needed. Sam Cooke's song, inspired by Dylan's "Blowing in the Wind," soon became an anthem for the civil right's movement, and poetically illustrates the difficulties that we need to overcome to make us a truly united nation. While it's been a long time coming, and many powers that be hope to keep it from coming, the promise of tomorrow is too great to not be seized by us today. This jam and a half is too pure, too strong, to make it deserve anything less than the "Jam and a Half'' title. Applicable to anything from the civil rights movement to the current health care promise, Cooke insists that a change is coming. You'll see. A Change is coming. Love that updated version, never heard it before, good stuff. For sure sister. Its too sad how they had to go. Otis is definitely up there in my favorite motown sounds, along with my boy Marvin another one who left too soon. Thanks for the looks Lydia and feel to hit us with any tracks you want up, Get Involved!! !